shirls gardenwatch: Grey Squirrel hides peanuts! Well, once again wildlife has found my garden after I have put out food for the birds. The peanuts have done it again! Although I have feeders for the birds I usually only put sunflower hearts in them. I tend to scatter peanuts and sultanas on the ground often under the little Acer tree, at my back door and opposite my window, for the group of blackbirds that visit. The peanuts and sultanas I believe are what attracted the hedgehog visits to my garden although I haven't seen many visits recently. Okay, so the title says it all but I cannot resist telling a story with some captions for my pictures! Okay so I've found the peanuts - now where could I hide them? Mmm I'm thinking about it... perhaps nearby? Okay, a quick check to see if the coast is clear. Ahh the bird bath helps I can see a spot now. Mmm I'll be cool about it and not give the game away! Grey squirrel eating, video 0:54 with background music, try 480p quality. Aghh ... Caught on video the game's up! Yesterday, I grabbed a late lunch and as I was preparing it I noticed the squirrel above through my window. It was a very, very, windy day and it had rained in sheets for spells. I noticed the bird feeders were quite quiet but then again they are in need of filling up but I wanted to clean them first. I always throw food on the ground when this is the case and that is probably why the squirrel stopped on its way through my garden. In the last week we have spotted it on a couple of occasions walking on the ground and having a drink from any puddles then scurrying off. I opened the window and threw some more peanuts under the tree then quickly set up my video camera inside. With the rain and wind the sky was heavy and dark but I did manage catch it and although it is on the dark side and once again the processing isn't the best but it still captures the visit well. Did you notice the squirrel patting the ground after it had buried the peanut? It is always tricky deciding which pieces of film to use. On a dry day I can put my camera outside but then again it isn't remote control so I cannot follow any wildlife as I can from inside. So taking pictures from my video or digital camera do loose a bit in quality as they are through glass but I was still thrilled with them as this is another first for my gardenwatch. Finally, I would like to point out that the grey squirrel has observed the colour theme of my border that it has chosen to store the peanuts - it is my silver border! Okay I have to be honest now as a gardener and say as these plants are fairly young and I wonder if it will break or damage the main stems. I really wouldn't be happy about that. I also don't know if I would be happy if this squirrel took all the peanuts every day and if it brought friends! Mmm a tricky balance, but for now I am enjoying our newest visitor to the garden a I hope to see it return. 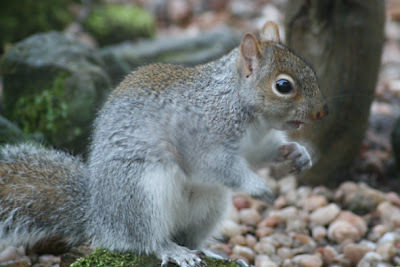 The photos and video of the grey squirrel shown above were taken in my garden on 5th December 2007. Great video of the squirrel burying the peanuts Shirl. While they are fun to watch you may rue the day this little creature found your garden. The Gray Squirrel has buried peanuts in our garden many times. One year we had several peanuts growing here and there in the garden. I then knew their favorite hinding places. We don't have the right environment for the peanuts to fully develop. I left several in the ground to see what would happen. They didn't mature. aw !! it looks SSSSOOOO innocent!! I know they are supposed to be the bullies of the squirrel world (and the little red squirrels do win in the cuteness stakes) but greys are still lovely. I only wish that mine would leave some sunflower hearts for the birds! I've tried the "squirrel proof" feeders but they still manage to "break in". Something I didn't know about them is that they eat fungi! I have a bit of film I took of one eating fungi. It looked really weird. Weather's awful in Dorset as well... hope it improves soon (north and south)! By the way, are you anywhere near the Cairngorms? You must have some stunning countryside nearby. They are such frenetic little creatures. Even their little jaws move at a quick pace! Nice video and love the allium post also. As a near-expert on squirrels in the garden, I can asssure you that you needn't worry about them damaging the plants when they bury the peanuts. It's only when things are 1st planted that the squirrels will dig them out of the ground to put in the peanuts in their places. As has Lisa, I've also had a couple of peanut plants sprout, but I've pulled them out. Are the greys more aggressive than the fox squirrels by you? Here, the fox squirrels are the dominant 1s. I can't get a clear picture of a grey because they run every time I open the door (I've trained them well), but Beggar the fox squirrel is very bold & will not leave unless chased out. My garden in London has a fair share of squirrel visitors. I know, because I spend much of my time digging up seeding oak trees which have grown from the acorns they've buried and forgotten about. So cute! I loved the video and your pictures!! Great! From time to time we have a squirrel in our garden too. But this is rather seldom! Thank-you! Yes, I am not sure if the squirrel visiting my garden is a good thing or not. I have been considering your comment. I very seldom see it so its visit was more of a novelty. I didn’t see it all today. That is such a cute squirrel. The squirrels here in my area are so ugly. Your squirrel is more like the ones we had in Alabama. If they are cute they are more tolerable aren't they. I love the video! I'm going to have to learn how to do that one of these days. Have a great weekend Shirl! 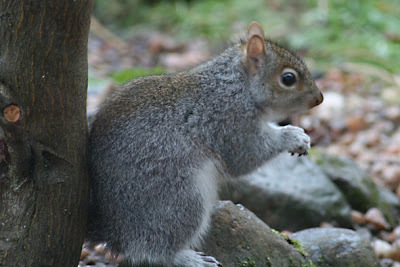 Our grey squirrels bury black walnuts and acorns in my garden. so in the spring I get to dig out dozens of volunteer weed trees. I guess the peanuts don't grow when planted. Yes, I have now heard many stories about plants growing thanks to the squirrel - perhaps it’s not all bad! I have never seen evidence of this in my garden and peanuts would definitely not germinate outside here.